The first portion of the 2019 Le Mans 24 Hours entry list was revealed on Monday, February 11, and there’s something peculiar about it. In a report from RACER, it seems to be that there will be a unique Ford GT in this year’s 24 hour race. Well, it won’t be a unique car, it will be a unique owner. As RACER puts it, this will be the first time that we will see a privately owned Ford GT in the Le Mans 24 Hours race. The Ford GT is owned by Viper Exchange owner Ben Keating, and it will compete in the GTE Am class. Keating will make the Ford GT a single-car entry in the race this June, and is a departure from the Dodge Viper-exclusive cockpit he’s operated in previous years. The Texan ran an ex-factory SRT Viper in 2015, then a Murphy Prototypes-run ORECA LMP2 in 2016, a Riley Multimatic LMP2 car in 2017, and a Risi Competizione Ferrari in GT Am last year. Keating’s Viper Exchange also played a major role in funding a grassroots time attack with a bone stock 2017 Viper ACR, which clocked a 7:03.45 lap time around the Nurburgring, without FCA’s help. All of this is to say Keating clearly loves cars, and loves racing. This Ford GT shifts the outlook of Ford Performance on their current GTLM/ GTE Pro cars. This season is set to be the final year of the joint IMSA/FIA WEC program, so Keating’s entry marks the first time that Ford has allowed the car to be raced privately. This has the potential of promoting additional customer programs revolving around GTLM in IMSA, and GTE Pro or GTE Am in the FIA WEC. Keating’s Ford GT entry is so far the only American privateer car in GTE Am, as French privateers Larbre Compétition stopped racing the Corvette C7.R in 2017. This will be the first Privateer Ford GT of the current generation of Ford GT’s to run Le Mans. The previous generation of Ford GT’s also had Privateers run Le Mans. One husband and wife team podiumed at Le Mans in 2011. We remember Ben. Good luck! We’ll be rooting for you! Also, Maytech ran a Privateer Ford GT at Le Mans in 2010. This is the 2005-6 Ford GT homolgated somewhat later. 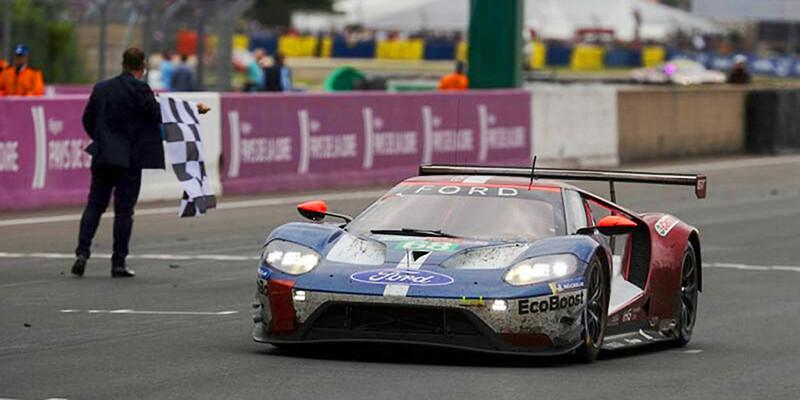 We are happy to see Ben doing this (and we were ecstatic to see the Ford factory back at Le Mans). Go Ben!